Rahul Dravid: Rahul Dravid ends his ODI career on a high! It was in the 13th over of Indian innings, a man walked on the ground to play his last innings. Stadium was a full house, packed with more of Indian supporters than the englishmen. Cameras started picking the banners in the crowd - "We are here just to show our gratitude towards him", "We will miss you, Mr.Dependable". It was pretty emotional moment for his fans, as this man never had a privilege of walking in with such a wonderful ovation. But that didn't change him - same concentration, same patience, same technique and above all - same hunger to win a match for his team - he never looked like someone who was playing his last game. It was just another day in the office for The Wall of India, Rahul Dravid. People were not there to watch his batting, neither were they expecting him to score a hundred - it was just that they wanted their Hero to know that he is loved, respected and idolized all over the world. He batted beautifully and it was really nice to see Rahul Dravid drawing curtain over his ODI career with a fluent 69 that helped India reach 300+ at the end of 50th over. He got out trying to increase the run rate for the team off the bowling of Graeme Swann, a bowler who ran out of ideas to get his out in the Test series. English players did not celebrate, no jumps, no cheers. They knew they were seeing this man in Blue jersey for the last time. 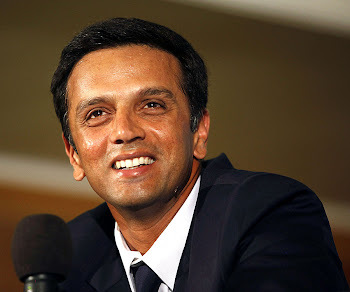 Rahul Dravid had a long walk back to pavilion with all English players congratulating for his cricketing journey and the crowd rising to say goodbye to the true gentleman of the game. I AM THE BIGGEST FAN OF RAHUL DRAVID IN THE WORLD.I HAVE ALWALYS PRAYED FOR GETTING HIM RUNS IN TEST,ODI,IPL, AND IN ONE T20.I AM THE BIGGEST FAN OF RAHUL DRAVID IN THE WORLD.I HAVE ALWALYS PRAYED FOR GETTING HIM RUNS IN TEST,ODI,IPL, AND IN ONE T20. but when the doors of the walls are closed the Gods are behind "THE WALL".